Citation Information: J Clin Invest. 2016;126(8):2919-2932. https://doi.org/10.1172/JCI86477. Tumor suppression that is mediated by oncogene-induced senescence (OIS) is considered to function as a safeguard during development of pancreatic ductal adenocarcinoma (PDAC). However, the mechanisms that regulate OIS in PDAC are poorly understood. Here, we have determined that nuclear RelA reinforces OIS to inhibit carcinogenesis in the Kras mouse model of PDAC. Inactivation of RelA accelerated pancreatic lesion formation in Kras mice by abrogating the senescence-associated secretory phenotype (SASP) gene transcription signature. Using genetic and pharmacological tools, we determined that RelA activation promotes OIS via elevation of the SASP factor CXCL1 (also known as KC), which activates CXCR2, during pancreatic carcinogenesis. In Kras mice, pancreas-specific inactivation of CXCR2 prevented OIS and was correlated with increased tumor proliferation and decreased survival. Moreover, reductions in CXCR2 levels were associated with advanced neoplastic lesions in tissue from human pancreatic specimens. 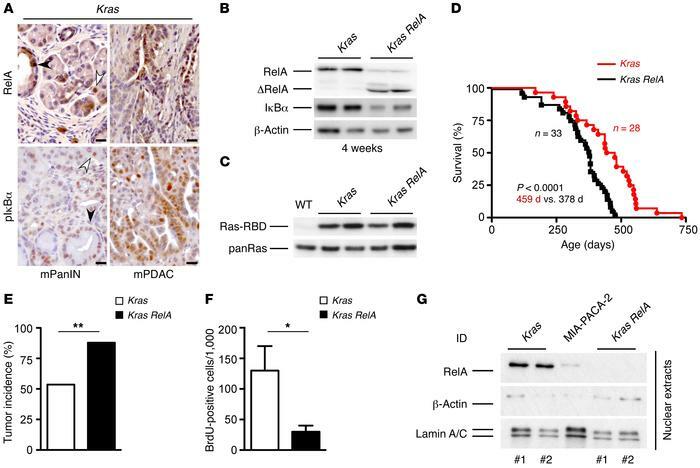 Genetically disabling OIS in Kras mice caused RelA to promote tumor proliferation, suggesting a dual role for RelA signaling in pancreatic carcinogenesis. Taken together, our data suggest a pivotal role for RelA in regulating OIS in preneoplastic lesions and implicate the RelA/CXCL1/CXCR2 axis as an essential mechanism of tumor surveillance in PDAC. RelA deficiency promotes pancreatic carcinogenesis. (A) IHC analysis of RelA and phosphorylated IκBα (pIκBα) in pancreata from Kras mice. Representative images show that RelA and pIκBα expression is intense in ductal lesions (black arrowhead), acinar cells (white arrowhead), and PDAC lesions from Kras mice. Scale bars: 20 μm. (B) Immunoblot analysis of RelA, truncated RelA (ΔRelA), and IκBα in lysates from 4-week-old Kras and Kras RelA mice. β-Actin was used as the loading control. (C) Immunoprecipitation of activated Ras (Ras-RBD) in pancreata from mice with the indicated genotypes. Lysate from a WT (LSL-KrasG12D) mouse served as the negative control. (D) RelA deficiency cooperates with oncogenic KrasG12D to influence survival. Kaplan-Meier analysis shows a median survival of 378 days in Kras RelA mice (n = 33; black line) versus 459 days in Kras mice (n = 28; red line). P < 0.0001 by Mantel-Cox log rank test; n, number of mice. (E) Tumor incidence was significantly lower in Kras (53.6%) than in Kras RelA (87.9%) cohorts. **P = 0.0041 by Fisher’s exact test. (F) Proliferation index of pancreatic tumors from mice with the indicated genotypes. The number of BrdU-positive cells was counted in 10 fields per mouse. Mean ± SD; n = 3; *P < 0.05 by unpaired t test; n, number of mice. (G) Immunoblot analysis of nuclear extracts from Kras and Kras RelA primary pancreatic cancer cell lines displays nuclear RelA in tumor cells isolated from Kras but not RelA-deficient Kras mice. MIA-PACA-2 cell line extract served as the positive control. β-Actin and lamin A/C served as loading controls.